Hear a first-hand, Muslim perspective about …. Current events & solutions for peace in Afghanistan. Challenges & improvements to education and women’s rights. Insights about America & Americans, with deep respect for Rotary, the US military, our democracy, and football! Robby Fouts led the pledge in a competent manner. Julia Parranto told us a couple of the things that she’s grateful for in Rotary, including the Fellowship, Kathleen Archer for sponsoring her, the McMillan’s who conspired to get her to Rotary today, President Doug’s enthusiastic leadership, the Giro Bello, Cathy Vicini’s jokes, the new women’s college in Afghanistan, and the announcement by Rotary International that Africa has not had a polio case for over one year. Yay! Mike Kelly from Sunrise, our speaker today; and hopefully, our member soon if we get our way! Daphne Bradley, President of the Cardinal Newman Interact Club was introduced by Ray Giampaoli. Peter Holewinski introduced his son Aaron is visiting from New York City. Queen Jeanne introduced Barbara Lee, formerly of the Internal Revenue Service (which drew a round of boos) and now a beekeeper. Ryan Thomas introduced his lovely daughter Jocelyn. Rich de Lambert introduced Brandon Ulrich, a returning member. Anne Gospe introduced her delightful son Jacob. And of course Big Daddy Jeff was late, so he was not there to introduce him. Mark Burchill introduced Danny Pederson, owner of Pederson Electric, and also a beekeeper. Anne Gospe attempted to take over for Cathy Vicini and tell us a joke about Florida and the moon. We miss Cathy! Tim Delaney ran the raffle and Elizabeth Karbousky had the winning ticket, but this time, could not get the jackpot and went home with $10. Brandon Uhrich was presented with his red badge. 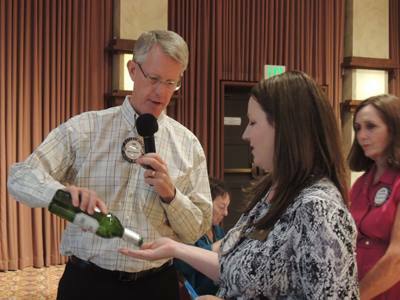 Dr. Shari has officially transferred her Rotary membership from the Guadalajara Club. David Brown, Rich de Lambert, Tim Delaney, Jack Geary, Vickie Hardcastle, Emily Harrington, Bill Hatcher, Frank Hodges, Darrell Horn, Lena Humber, Shannon McConnell, Sam McMillan, Joy Parker, Bill Pedersen, Chip Rawson, Sam Saunders and Jack Tolin – whew! 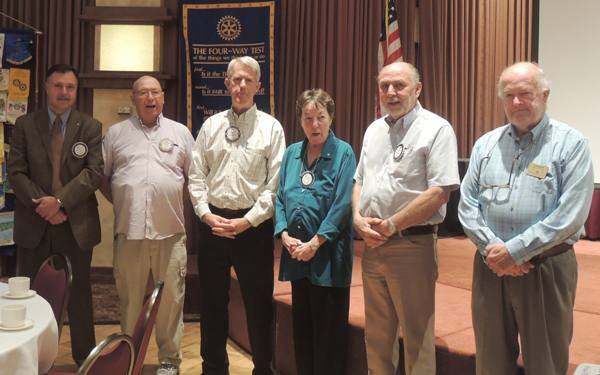 President Doug announced the upcoming SCARC meeting hosted by the Rotary Club of Rancho Cotati on August 27, 2015 from 530 to 8:30 PM. The cost is $45 and the event will be held at the Sally Tomatoes Event Center. RSVP to cschollmann@aol.com to attend. President Doug also announced the Foundation Dinner on Saturday, October 24, 2015 at the Flamingo Conference Resort and Spa, starting at 5:30 PM. Dinner is at 6:30 PM and dancing is at 8:30. The cost is $65. The theme is Monster Bash and anyone in a costume gets their name entered into a drawing for a Paul Harris award. A registration link will be sent to each Rotary members e-mail soon. Pres. 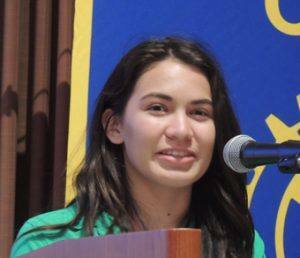 Doug also announced a welcome pot luck reception for our newest Santa Rosa Rotary exchange student, Luciana Steinbach, from Santa Cruz, Bolivia. The reception will be held at Larry and Mary Miyano’s home at 4004 Garnet Place in Santa Rosa, Monday, August 17 from 5:00 to 8:00 PM. Bring your favorite dish and drinks to share. Please RSVP at 738-2807 or 538-5520. Pres. Doug also reminded us that on Saturday, August 29th, there will be a 4H event honoring Steve Olson from 3 to 8 PM at Richards Grove. Elizabeth Karbousky announced that there will be a family social at Nicole Le’s on Sunday, August 30. Bring your kids or grandkids. Jeff Gospe announced the return of Aimal, aka Zabitullah Aimal, who came to speak to us in June. This was a great program in June and because it seemed like there was not enough time to say everything he had to say, he has been brought back to finish his program. He will be with us at our program on Wednesday, August 19. This would be a good time to bring guests. President Doug also announced, again, that we will be having an evening with Razia Jan, the woman responsible for the development of the new women’s college in Afghanistan. (President Doug put “girls” college on the schedule, but we know what he meant.) The evening event will be at the Scottish Rites Temple and should be a lot of fun. Pres. Doug announced that we will be doing a rest stop for Levi’s Gran Fondo on Saturday, October 3 from 7:30 AM to noon. Come help out! Pres. 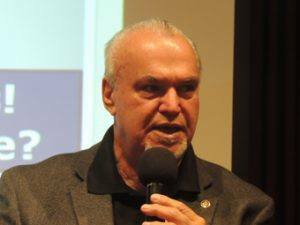 Doug also announced that at the latest board meeting, your board adopted the new organizational chart for the Giro Bello, the highlight of which is that we now have two co-directors instead of one director. This year those co-directors will be Tim Delaney and Don McMillan. Thank you, gentlemen, for stepping up to the plate. Also, Jack Atkin gets a lot of the credit for working on the new chart. Thanks Jack! You might recall that Mark Burchill, our immediate past president, was previously recognized for his published letter to the editor. Well, Pres. Doug noticed a rebuttal piece directed at Mark by some hippie dude who markedly resembles Steve Olson. This gentleman apparently wrote a letter to the editor rebutting Mark’s letter and mentions Mark by name three times, so Mark gave $30 to his brother’s Paul Harris. Somehow all of this had something to do with Ray Giampaoli, mortgages, special forces and karate!? Marnie Goldschlag was recognized for having taken a trip to Alaska, which she astutely identified as a state (kind of came off a little bit like Sarah Palin there dincha? ), and is apparently “awesome”. Marnie took this trip with her in-laws, and the club was astounded to learn that Marnie’s mother-in-law is only 10 years older than her son. Hmmm. Marnie generously donated $50 to her Paul Harris. Ray Giampaoli introduced Daphne Bradley, president of the Cardinal Newman Interact Club. Daphne is a Senior and has been in the Interact Club all four years of high school. She will be studying nursing at USF in the fall. Daphne Bradley then gave us a 10 or 15 min. presentation about her experience with the Rotary Youth Leadership Camp that she attended this summer out at Westminster Woods. Our club sponsored her to do this and it was paid for out of the Rotoract/Interact budget. Mike Kelly from the Sunrise Club gave an excellent presentation about bees and beekeeping. Mike encouraged all of us to get rid of any pesticides we may have in our cupboards and to plant a meadow where our lawns are. Mike educated us on the reasons for the recent drop-off in the number of bees in the country, including pesticides and the tendency to grow only one crop in a given area. For example, almond trees are in blossom only four months of the year, so if that’s all that is planted in a several acre area, the bees have nothing to eat for eight months of the year. Very interesting program. Well done, Mike! 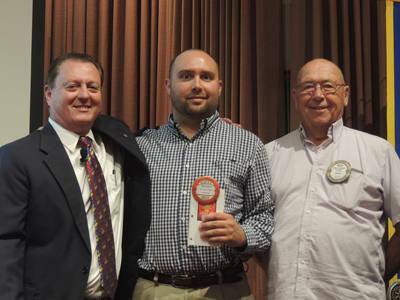 Past President Donnie Mac then invited Mike to bring his drums and join the Rotary All-Star band. Robby Fouts bemoaned the use of pesticides by homeowners. If you must use them, please, use them properly. Pres. Doug concluded the meeting by thanking everyone who helped with the meeting: Robby Fouts, Julia Parranto, Joy Parker for Visiting Rotarians, Sam McMillan was a greeter, Blaine Goodwin was the lunch ticket taker, Judy Glenn and Matt Fannin sold tickets, and Tim Delaney did something. Is my hearing going or is Prez Doug’s accent getting worse? !